We believe in providing the best services available to get the job done on time, on budget and without complications. Our customers trust our job performance and many become repeat customers and even refer us to their friends and family. "Our old drain field tiles shifted resulting in a plugged drain field, ugh! The soil is heavy clay and to make matters worse, underground springs flowed into the area. To our rescue came Dan of Dullock Excavating. Thank goodness! He has an important skill set: he can drive the dozer and problem solve at the same time and then effectively communicate workable possibilities to both the home owner and the County Health Agent whose approval is required for these projects. We now have a fine septic system with drain tile added to divert the underground water around it. Dan solved a couple of land contour problems to make easier mowing and put in a new lawn. Not only that but he and his assistant helped us handle several downed trees after the recent storm and we had thank you notes from our neighbors because Dan helped them remove trees from the road on his way to our house. It was interesting to watch the work, and work they did! Now our only excitement will be watching the grass grow." "We wanted you to know how much we appreciated your careful and professional work on our new home site. We have commented several times about how nice it looks and how impressed we were with the care you took with your work. We felt that you did your job as if it were your own home you were taking care of. It made us feel at ease and grateful for your knowledge and time. Thank you so much. In our line of work we are asked for referrals regularly and will not hesitate to refer you often." "I didn't know what needed to be done for a driveway to support a 16,000 pound RV. Dan spent time with me walking the the area and asking questions about the ground. Dan impressed me with his knowledge of the different materials and was able to discuss the pros and cons of each. Estimate was what I considered to be a very fair price for the work involved and Dan offered up landscaping ideas that could be done with the topsoil that was to be removed for the drive. I followed Dan's recommendations and am extremely happy with how the project has turned out. Dan was on the job when he promised and in fact was ahead of schedule due to favorable weather and good old hard work. I now have a great solid drive and a yard that is leveled. No more getting the RV stuck in a muddy rutted yard!" "We had water coming in, they were here the next day. They told us what needed to be done, they did it, and left our yard in better shape than it was originally. Thanks Dullock Excavating, for a dry basement and nice yard." "We have used Dullock Excavating who brought in grave stone for our landscaping project. He was one of the sub-contractors. He stood out pretty well because he helped with our pool and told us how to start the pump and how you clean the filter because he has a similar pool. It was never offered by the pool installer. Not only did he do everything that he was hired to do well, he went above and beyond the call of duty!" "We purchased a home with acreage and ZERO landscaping and had no idea the possibilities available. Dan Dullock was very helpful with suggestions and his insight proved exactly what our property needed. Dialogue with Dan is especially easy because he treats you like a friend and offers his honest, experienced opinion. Dan has made improvements on 3 separate occasions at a very fair price and we will continue to utilize his services." "Dullock Excavating did a great job with our project. Dan Dullock went over and above to make sure that we were satisfied with his work. He even was able to provide suggestions for our excavation project. He was there when we needed him and offered a very reasonable rate for his work. We would recommend Dullock Excavating to anyone." "I have to commend Dullock Excavating for the work they did to repair my pond and restoration where a large pool was. The pond was an especially difficult project but with Dan's ideas and hard work, the end result is attractive and permanently repaired. He was always here when he said he would be and finished the job on time. Two qualities I find quite rare these days. 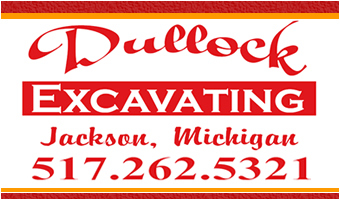 Dullock Excavating has exceeded my highest expectations and will do the same for you. I've hired a lot of different companies and when I say none compare to Dullock Excavating - believe it! I will definitely refer Mr. Dullock to everyone without hesitation. Thanks Dan for a job well done!" "I write in recommendation of Dan Dullock. Mr. Dullock has provided services to myself and my wife for installation of an approximately 30' x 430' driveway serving our property and properties of our four neighbors, installation of a circular driveway on our property at 1820 Eagle Point Road, Clark Lake, Michigan, and clearing and grading of a lot on Eagle Point Road. In all of our dealings with Mr. Dullock we have found him to be punctual, to always do what he says he will do and when he says it will be done, to have done each of the jobs noted in an extremely professional and competent manner and, perhaps most importantly, to be a person of integrity. We have every intention of engaging Mr. Dullock's services again and we recommend Mr. Dullock without reservation." "I want to thank you for the excellent contribution of four days of excavation services to Sandstone Congregational Church during 2008. The bulldozing work was of enormous value in finishing the Sports Mountain Project, and the backhoe and dump truck work was of great assistance in furthering the progress on the property berm and walking trail construction. This progress would not have been possible without your assistance. We are deeply grateful for your generosity and contributions to our church and community in this way."